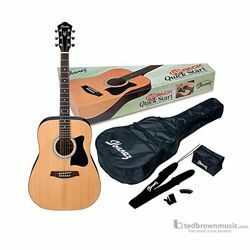 The Ibanez Ibanez IJV50 JamPack Quick Start offers you a fantastically low priced acoustic guitar package with everything for the beginning guitarist. The V50 natural finish acoustic guitar boasts a spruce top for fantastic tone. The guitar package also includes an accurate electronic tuner, gig bag, guitar strap, and an accessory pouch.